Actually outstanding Science Fiction on a Zero Budget. Between 1955 and 1967 and if you were a frequent television viewer. When the name of producer Ivan Tors was mentioned. The following shows come to mind: 1955's "Science Fiction Theater", 1958's "Sea Hunt", 1964's "Flipper", 1966's "Daktari" and 1967's "Gentile Ben". In my case I knew all five. Released on February 18, 1953 this low budget motion picture had a lot going for it. To begin with the script was by Curt Siodmak and Tors. Siodmak, who also directed, should be known to all fans of classic horror motion pictures. He had written the screenplays for "The Wolfman", "Frankenstein Meets the Wolfman" "I Walked with a Zombie", "Son of Dracula" and the often not seen "The Beast with Five Fingers" among others. Richard Carlson's co-star was actor King Donavan, Who was a face known to many, but a name that was not. Donavan would follow this picture with three other science fiction films. Two of which are considered classics. They are Ray Harryhausen's "The Beast from 20,000 Fathoms" and director Don Siegel's "Invasion of the Body Snatchers". The third is the next film in this trilogy I will write about. The 76 minute long "The Magnetic Monster" was smartly written by Siodmak to use every cent of Tors' low budget in documentary style. There by permitting a large portion of voice over narration by Richard Carlson. The story opens with two agents of the Office of Scientific Investigation (OSI), Dr. Jeffrey Stewart (Carlson) and Dr. Dan Forbes (Donovan), being called to a local Los Angeles Appliance Store. What they find is that all the clocks have stopped at exactly the same time and metal appliances and other items appear to have become magnetized. Investigating this phenomena leads the two agents to an office directly above the Appliance Store and the discovery of a body. Inside the now abandoned office space. They discover scientific equipment, but there is no way for the two to figure out what actually happened or what the equipment was used for. Per routine they have checked for radioactivity of any kind, but there is no trace evidence. Curt Siodmak's screenplay takes it cue from the science discoveries of the period and theories as related to nuclear isotopes. He has Dr. Howard Denker create an isotope under uncontrolled conditions which becomes the monster of the title. Asking for the public's assistance in their investigation Doctor's Stewart and Forbes are informed of an incident still occurring on a passenger plane in flight. It is Denker whose lips are bleeding from what will turn out to be radiation sickness holding onto a brief case he refuses to let loose of. Once the plane lands the two OSI agents board it and before Dr. Denker dies. He tells Dr. Stewart that the isotope needs to "FEED" every "11 HOURS". By feeding it absorbs any available energy from its surroundings by sending out a magnetic field. The isotope Denker calls "Serranium" is also radioactive, but more importantly it "DOUBLES IN SIZE AND MASS" each time it feeds. The isotope is brought back to the OSI laboratory for examination and confirmation of its potential as described by Dr. Denker. It is determined that at the current rate of growth and increase of the isotope's mass. It will only be a few more weeks, before it will cause the Earth's rotation to be effected and the planet sent hurling in to outer space. A decision is made to contact the Canadian Government for use of their undersea power generator dubbed the "Deltatron". Which is still being constructed. The plan is to over feed the isotope until it can't absorb anymore and continue feeding it beyond that point causing the isotope to, hopefully, destroy itself. After a confrontation between Dr. Stewart and the foreman of the Canadian Plant. Stewart locks everyone out and proceeds to feed the isotope with the energy being generated by the Deltratron. The plan works and the picture ends with Dr. Stewart and his pregnant wife Connie entering their newly purchased first home. Low budget, or not. This motion picture still generates suspense and was the first example of Ivan Tors utilization of known science facts in his work. For the scenes of the "Deltratron" Curt Siodmak went back to his life in Germany. He had been in an extra in Fritz Lang's "Metropolis". In 1934 UFA had released a motion picture entitled "Gold". "Gold" starred Brigitte Helem who played Maria and her robot double in Fritz Lang's "Metropolis". The German movie is about a British scientist who is convinced he can create gold from base metals by using an giant underwater Atomic generator. 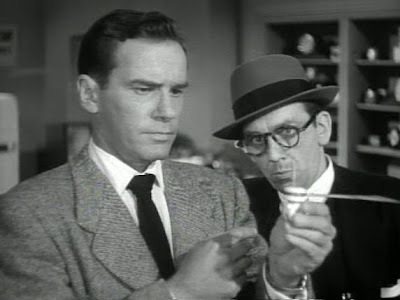 Siodmak had Richard Carlson wear the same looking clothing as scientist in "Gold" and matched him with the Atomic generator as the "Deltratron" in "The Magnetic Monster". This use of stock footage from the first motion picture works very well and of course was another budget saving technique for Ivan Tors. Richard Carlson was back in third billing after William Lundigan as Dr. Richard Donald Stanton and Herbert Marshall as Lundigan's father and head of the space project Dr. Donald Santon. Richard Carlson's role of Dr. Jerome "Jerry" Lockwood wasn't the lead as he was also the motion picture's director. The two actresses in the movie were Martha Hyer as Dr. Jane Flynn. Ivan Tors believed women were not limited to the 1950's stereo types roles seen in motion pictures and on the new medium of television. "Riders to the Stars" also featured actress Dawn Addams as Susan Manners. As I said above King Donavan returned playing OSI Security Chief James F. O'Herli. 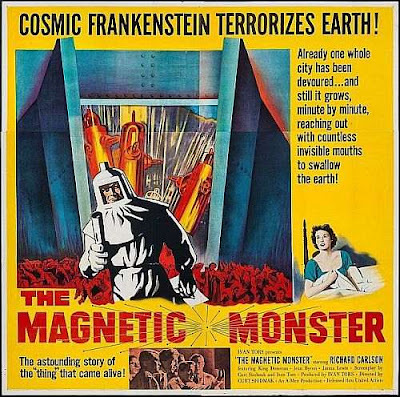 The 81 minute color feature film was once more written by Curt Siodmak and was based upon scientific theory concerning meteors and space flight in the early 1950's. It tells of a group of men, all must be single, brought together to undergo a series of tests for initially an unnamed misson. 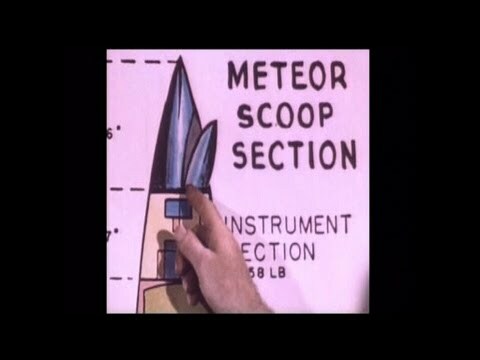 Those chosen will eventually fly outside of the Earth's atmosphere on a specially designed space craft with a scoop to catch a meteorite that is completely intact. Siodmak's script explains that Herbert Marshall's Dr. Donald Stanton is one of the men behind a United States project to explore our solar system. They are faced with finding a material for the outer shell of a deep space craft and believe that the elements in a meteor might hold the solution to their problem. The story has three of the scoop ships launched. One with Lundigan, one with Carlson and one with Robert Karnes as Walter J, Gordon. Below is William Lundigan inside his space craft. Robert Karns' Walter Gordon attempts to catch the first meteorite, but its two large for the scoop. The ship explodes and Gordon is killed. Richard Carlson's "Jerry" Lockwood has a mental breakdown after seeing what happened to Gordon and Gordon's skeletal remains floating in space. In panic Lockwood fires his space craft's rocket engines and heads into deep space and eventful death when he runs out of fuel. This leaves William Lundigan's Dr. Richard Donald Stanton to attempt the capture. The problem Stanton now face is based upon calculations from the ground. He may not have enough fuel to capture and return safely to Earth with a meteorite. Of course he goes for it and returns successfully. The story ends with the scientists of the Office of Scientific Investigation discovering a crystalline pure carbon coating on the space rock and the possible source to build space ships for exploration of the stars. The picture of course was low budget and like most such productions did use stock footage, but it worked within the story line and did present "pseudo-scientific mumbo-jumbo". However, the "mumbo-jumbo" was fairly accurate for the time. 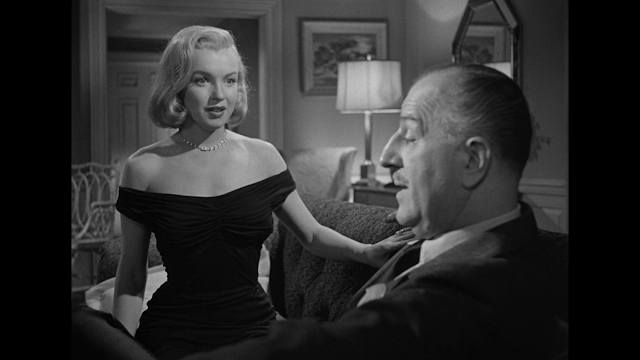 Reviewers looking back at "Riders to the Stars" might be correct that the movie wasn't very great, but they also recognized it for being one of the first motion pictures to attempt to show early discussions of possible space exploration based upon known, for the time, scientific fact and theory. Nine months after the release of "Riders to the Stars". William Lundigan starred on the television series "Men Into Space". The series was very much like the Ivan Tors motion picture and some episodes were made by Tors. It told of the United States Air Force's work to advance aircraft design and explore outer space. The story's setting was suppose to be the mid-1970's and the first moon landing had taken place in 1975. As with the Ivan Tor's motion picture the one season 38 episode series utilized United States science theory as its basis. On June 5, 1954 the final installment of Ivan Tors' "Office of Scientific Investigation" trilogy was released, but not written by Curt Siodmak. When "GOG" came out the 3-D craze was at it's height and Ivan Tors and director Herbert L. Stock, who received no screen credit on the first two pictures, made excellent use of the process. There is a sequence that starts the film showing a scientist entering a test chamber for extreme cold. Suddenly the door, which fills the screen, closes on him, the locking handle, also filling the screen, starts to spin and the control switch starts to move causing the scientists death within. Actually this is both the start of the picture and the reason to bring Richard Egan's OSI agent David Sheppard to the project. Who is murdering scientists attempting to perfect the environment for man's first Space Station? Herbert Marshall has returned as the head of the project. This time his name is Dr. Van Ness. Sheppard is first seen flying in a helicopter over the New Mexico desert and rising out of the landscape is a giant reflecting mirror and other listening devices from the under ground project. The entrance slides back and the helicopter descends downward to the landing bay. Marshall introduces Egan to the scientists without revealing he's an OSI agent. What Van Ness doesn't know is that his secretary Joanna Merritt, played by Constance Downing, is also an OSI agent planted at the facility. Additionally Sheppard and Merritt are the love interest of the story. The entire facility is controlled by one central computer "NOVAC (Nuclear Operative Variable Automatic Computer)" and the question becomes is somebody remotely controlling it and if so who and how? As critics noted the picture is grounded in science fact rather than fiction. The "GOG" of the title and it's counterpart "MYGOG" are multiple limb robots. As with everything else they are controlled through "NOVAC".Making them very useful to all the scientists, but also deadly as they are also have a flame thrower. Why they needed that other than it makes a good 3-D effect is never mentioned. Of course with the "Cold War" in full form and Americans fearing Soviet Atomic Bombs. Writers Ivan Tors, Tom Taggart and Richard G. Taylor choose the names of the two robots from the Biblical references in "Genesis", "Ezekial" and "Revelation's" firmly in their minds. Should you don't understand. Look up "Genesis 10", "Ezekial 38" and "Revelation's 20". The title was not lost on the audience, or critics at the time. At the film's climax OSI Agent David Sheppard finds out that while "NOVAC" was being constructed in Switzerland. A receiver/transmitter was installed by an unnamed Foreign Power. American's did not need to know the name of that Foreign Power. The alarms sound and Sheppard and Merritt are told Mygog is in the nuclear power room and pulling out the control rod. Sheppard fights Mygog and stops the robot with a flame thrower, but Gog than attacks and a second battle takes place. The double battle is followed by Sheppard confirming that there is some form of plane, with a fiberglass body to make it undetectable to radar, flying above the project transmitting a signal to the super computer. Jets are dispatched and the plane is destroyed. Dr. Van Ness contacts the Secretary of Defense telling him that a "baby space station", think satellite, will be launched.